The all-new Acer ConceptD laptops are what happens when Acer takes all of their expertise in creating gaming laptops and turns them into something designed specifically for video editors, illustrators, and creators, as well as to take on Apple’s MacBook Pro. It’s no secret that Apple has had a fairly sizable share of the creator market for years with their MacBook and MacBook Pro. However, it’s also no secret that more and more creators are starting to look towards cheaper, Windows alternatives. The market is already starting to respond, but there just aren’t that many alternatives yet. Consider the Acer ConceptD laptops as the latest and one of the best in the growing line of reasons why creators should switch over to Windows and eschew Apple starting today. Acer announced their new brand, ConceptD, earlier on April 11, Thursday, at the Acer Global Press Conference in New York. The Acer ConceptD laptops will initially come in three variants, each designed to help position the company to give creators a viable Windows alternative to the MacBook Pro at various price points. The ConceptD 9 is the flagship of Acer’s latest line. Acer claims that they designed it specifically for drawing and 3D work. To this end, they equipped the Concept D 9 with a convertible 17-inch 4K display. Not only that, but the display is also Pantone validated and has a near-perfect <1 Delta-E accuracy rating for maximum color accuracy. The display also uses the same Ezel Aero Hinge as that of the Predator Triton 900 and comes with built-in support for Wacom pen. Under the hood, the ConceptD 9 comes equipped with a latest ninth-generation Intel Core i9 CPU, an RTX 2080 GPU, as well as support for up 16GB of DDR4 RAM and 1TB of SSD storage space. For modern accessibility, Acer equipped the ConceptD 9 with Thunderbolt 3, USB Type-C and DisplayPort 1.4 ports. The ConceptD 9’s smaller brother, the ConceptD 7, is a bit smaller. It sports a 15.6-inch 4K display and “only” comes with up to a Core i7 processor. You can also choose to have it with an RTX 2080 Max-Q GPU or the RTX 2060. The ConceptD 7 also doesn’t have the same convertible screen as the flagship of the line, nor the same pen support. However, it does come with the same storage and RAM options, making it a more traditional and more affordable laptop alternative. Finally, the ConceptD 5 is the least powerful of the three. It still has the same 15.6-inch 4K panel as that of the ConceptD 7. However, underneath, it’s a bit slower, albeit still capable, with 8th-Gen Intel Core i5 and i7 processors powering it, along with the AMD Radeon RX Vega M GPU. Both RAM, as well as storage options, are also limited for the ConceptD5 compared to the ConceptD 7 and Concept D9. But, if it’s any consolation, the Concept D5 is the smallest and lightest of all the Acer ConceptD laptops. 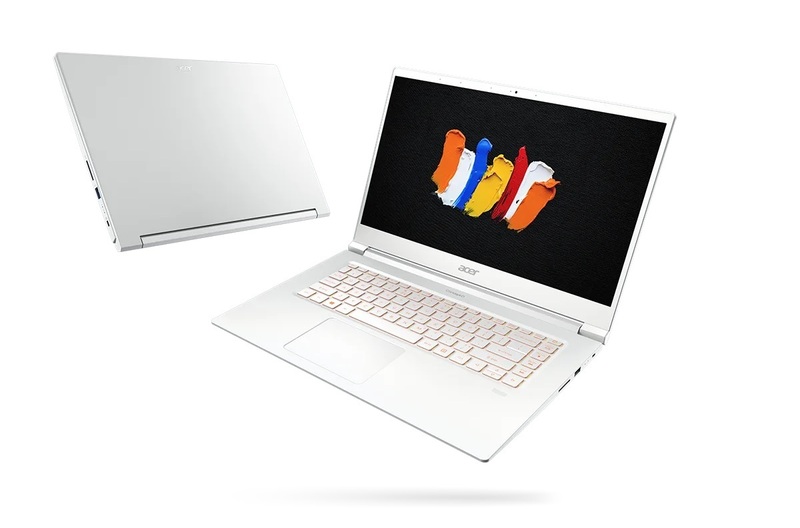 When Are the Acer ConceptD Laptops Going to Release? The Acer ConceptD 5 and ConceptD 7 will start selling as early as later this month of April. The former will start selling at a $1,699 price point, while the latter will set users back at least $2,299. The more powerful Acer ConceptD 9 is not set to launch until later on in June. The flagship product of the new line will start selling at a $4,999 price point.